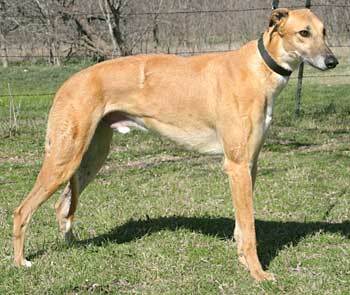 Adam is a 3½-year-old red fawn male born December 31, 2003. Adam is the "B" pup in his litter and was not individually registered with the NGA. His sire is N Big Ed and his dam is Cleo Money Train. 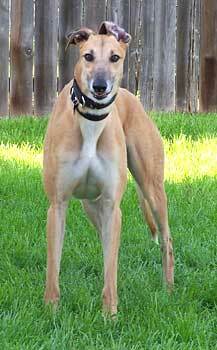 Adam was found as a stray by the Fort Worth Animal Control in early March 2007. Adam has been successfully treated for Ehrlichia, Rocky Mountain Spotted Fever, and Babesia, and he will need to be monitored periodically for the rest of his life for these. 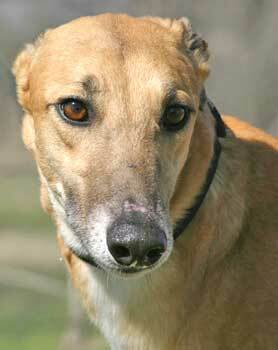 Adam is small animal and cat tolerant, as he lives in a foster home with two other greyhounds and cats. As you can see, he is one handsome boy. One thing I can say about Adam is that he LOVES attention. If you are the type that loves to give attention, then he will be your best friend! He loves for us to rub his face with a towel when he comes in from outside and will push in front of our two greys to get an ear rub or a neck scratch. When Adam first came into our home he seemed more comfortable being outside (we think because he was a stray). Now he really loves the indoors, the cool air conditioning, as well as the comfy dog beds and blankets. He loves to go for his daily walk and if you like to power walk and get that heartrate moving, he has no trouble keeping up. During the hot summers, we do take him for walks in the morning when the temperature is a bit cooler. Adam has a hearty appetite. He is slowly learning to play with toys and loves rawhide bones and pigs ears. Adam has shown no interest in our cats, in fact he does what he can to avoid them, often moving away from them if they are close. We do keep our eyes on him, as a safety precaution for our cats, and are ready to tell him "No Cats" if necessary. Adam has gotten used to the routine in the house. Now he usually goes into his crate when I get out the milk bones for the greys in the morning before I leave for work. He spends his days in his crate (while we are work) and at night he sleeps in his crate with the door open or on the floor beside our bed (on a cushy blanket, of course). 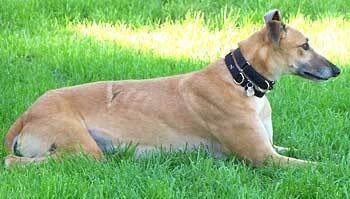 He has been one of our most easy-going fosters and fit well into our home and with our two greys. Adam is not very happy about going for car rides. I would recommend taking him for a long walk before a car ride to tire him out. He does not jump in the car. He usually needs to be lifted, so I would recommend a vehicle that is closer to the ground to make getting in a bit easier. Please do not let this discourage you, though. Adam is a wonderful grey and one handsome boy with eyes that will just melt your heart!